flyboynav has no other items for sale. 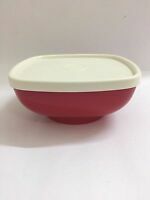 Tupperware SERV-ETTE Square Container Red Plastic Bowl with white color Lid NEW! Tupperware 1588-2 Dry Food Canister Green Lid Made of Plastic.